The winter months in Scotland can be truly beautiful, white dusting of snow on the mountain tops, brisk winter morning walks, hot cocoa and warm cosy fires. 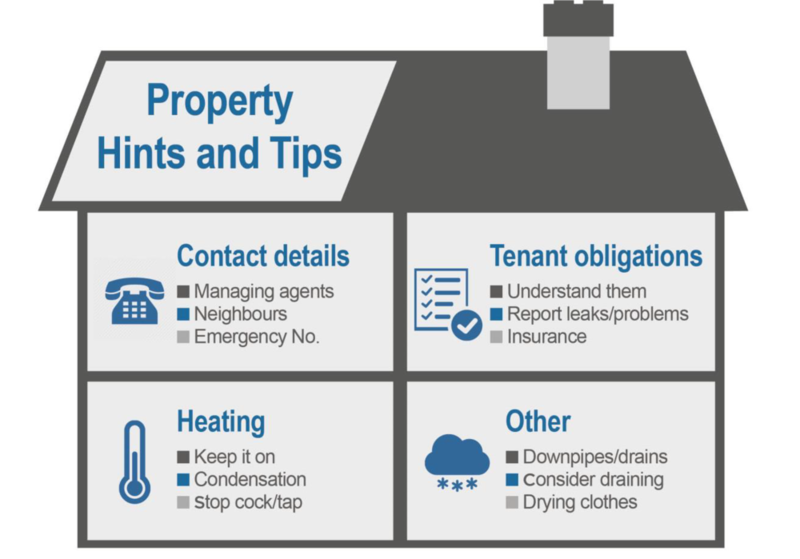 As a tenant of a rented property it is your responsibility to ensure that you maintain your property in line with your licence agreement. Re-read your lease agreement to see if there are any specific obligations required during Winter such as obtaining empty care checks or notifying your landlord if the property will be empty for an extended period. One of the biggest risks during winter are frozen pipes. Your boiler should have been checked as standard when you first moved into the property, however this is required to be done annually. So, if it is longer than 12 months since you entered your property make sure to contact your landlord or property management company, so they can arrange for the annual gas safety check. KEEP IT ON. Keeping your heating on continually throughout winter is advised. Use your homes central thermostat to control the temperature. By doing this if you are away from the property it will keep the pipes warm and hopefully prevent freezing and excessive condensation. If you are planning on leaving your property empty for a prolonged period over winter (possibly returning home for Christmas). Check your lease agreement for obligations under these circumstances. Review all property security to ensure it is fully working, such as alarms, front and back door locks and security lighting. Relocation Scotland would also advise you to put some form of automated lighting in place. This will deter burglars as it appears that someone is in the property. DO NOT DRINK AND DRIVE – Please remember that in Scotland we have a zero-tolerance policy in place for drink driving. With the festive season around the corner please be aware of other less cautious drivers on the road, particularly in the wet and icy conditions. The weather can be unpredictable during Winter so best to be prepared. Ensure that you have road side assistance in place and the contact numbers are easily accessible. In case of breakdown you should store a rug, spade, deicer and hi viz jacket in your car boot. GRIT – It is advisable to obtain a store of ice grit in preparation of the colder weather. Local councils generally only grit main bus routes and pavements so local driveways and paths could be extra slippy in ice conditions. Review your contents insurance. if you don’t have any in place now is the time to secure this. Make sure that your insurance provides suitable cover for contents in case of burst pipes. If you have any questions regarding our Winter Tips and how Relocation Scotland can help you please do not hesitate to contact us on +44 (0) 1224 648488 or info@relocation-scotland.com today.